Off the shore of Krawk Island, lies a very strange machine that allows you to exchange your Dubloons! So, yer in need of exchangin' some Dubloons, eh? You've come to the right place! Dubloon exchanging can help you organize your (possibly) massive Dubloon collection. Here at the Dubloon-O-Matic, you can exchange several of your Dubloons for one of a higher denomination. Check the boxes underneath the Dubloons you wish to exchange, then select the Dubloon denomination that equals to the same amount in the drop down box. Note: You cannot trade in dubloons for lower denominations with this machine! Here's a list of all the Dubloons currently in existence. In the table below, you can click on the item images to view more information about them in our Item Database! This list doesn't include Dubloons that have no denomination or worth, like the Toffee, Clay, and Platinum Dubloons. They may look cool or be extraordinarily expensive, but they're actually useless. Exchanging your Dubloon coins for a higher Dubloon denomination is usually not a good idea, if the lower denominations are worth more Neopoints. Check the price ranges for each Dubloon denomination before you make your exchange, unless you don't mind the Neopoint value difference. There are two ways you can get lower denominations for your Dubloon, though it will take away from the full value of your Dubloon. When you purchase any meal from the The Golden Dubloon with a Dubloon of a higher value, you will receive the appropriate Dubloon 'change' in your inventory. When you purchase a petpet from the Little Nippers with a Dubloon of a higher value, you will receive the appropriate Dubloon 'change' in your inventory. 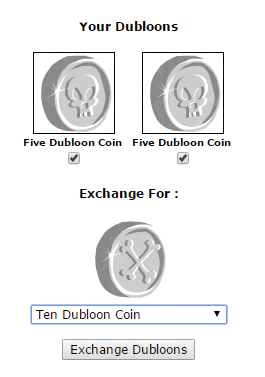 Most of the petpets in this shop require a lot of dubloons, so buying one of the the cheaper petpets would be best.